The weather has been more confusing lately. There are days when it feels like we’re stuck inside an oven, but the rain has been more frequent also. Once you hear the pitter patter of the rain on your roof, how about preparing a yummy rainy day favorite? Here’s our recipe for a Ginataang Halo-halo. Quick comfort food for a chilly day! 1. 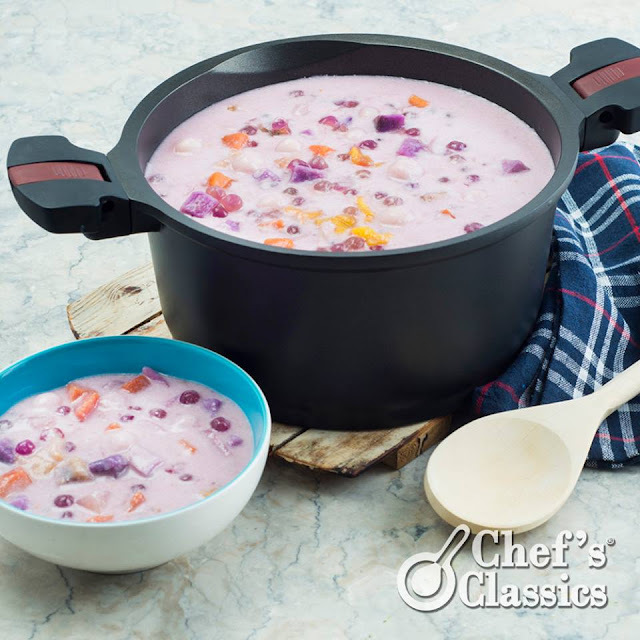 In Chef’s Classics Caper Sauce pot, pour the coconut milk and water. Bring mix to a boil. 2. Add glutinous rice balls, sweet potatoes, purple yam, sago, jackfruit and banana. Simmer for 5 minutes or until all the ingredients are cooked. 3. Add sugar and coconut cream. 4. Remove from heat and transfer to a bowl.